Throwing all caution to the wind, your intrepid bloggers are going to wander into this rat’s nest. Are artificial sweeteners OK? Some evidence says maybe, and some, maybe not. What do you think? We have ducked this in both the book and on this blog. Why? Because there is evidence that artificial sweeteners are bad for you, meaning that they are associated with adult onset diabetes—just as if they were real sugar. But, there doesn’t seem to be any direct reason why this would be. Woofing down a 12 oz. Coke Classic, a 39 gram sugar jolt, will cause a hormonal riot that will a) spike insulin, b) shut down fat metabolism, c) turn on fat storage, d) convert any of that sugar it can’t get the cells to take into more fat. If this sounds like a formula for diabetes, you are right. But suppose you woof down 12 oz of Diet Coke, you imbibe 0 grams of sugar, and 0.17 grams of an artificial sweetener. It tastes as sweet as the real thing—more or less. Your palette is fooled, but what about your body? Well, to be honest, we both thought it was fooled too, but this turns out not to be the case—as far as we know. The above-described insulin-driven hormonal song and dance doesn’t happen. Nothing happens. Nothing budges. The palette was fooled, but nothing else was. No insulin spike, etc. In fact, in the case of aspartame, almost none of it gets into the bloodstream at all. On the other hand, recent research, found here, describes a rather strong association between artificial sweeteners and adult onset diabetes. Association has the same meaning in medical research as circumstantial evidence does in a courtroom. Often we conclude cause in either case, but in medical research as well as law, it is tough to convict on just circumstantial evidence. And rightly so. This research was on sweetened beverages, and would include the other sweeteners. Aspartame and saccharin dominate the market, though. So what could be going on here? We do not find a smoking gun anywhere. Is there a scenario that would satisfy the conflicting facts: there is no hormonal effect, but a strong association with adult onset diabetes. Here is what we think is going on. But this doesn’t seem to be working. The problem is probably this: an adult onset diabetic should give up all sugar, and all starch. Anyone who actually does this will find that eventually, craving for sugar and starches subsides. This may take two weeks or it may take twenty. Everyone is different. Aspartame and saccharin are the most widely used artificial sweeteners, and aspartame is by far the most studied. In fact it may be the most studied additive of all time, but not for a very reassuring reason. When aspartame first went into tests, in 1974, the FDA found that the company that owned it, G D Searle, was guilty of “serious deficiencies in Searle’s operations and practices.” Aspartame went off the market. After years of legal and research controversy, aspartame reappeared, with seemingly well-vetted approvals. Why this herculean effort? Follow the money. 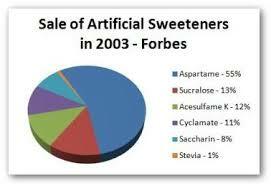 Artificial sweeteners are a 20 billion dollar industry. Here’s the Wikipedia take: “Aspartame has been found to be safe for human consumption by more than ninety countries worldwide, with FDA officials describing aspartame as ‘one of the most thoroughly tested and studied food additives the agency has ever approved.’” Completely convinced? Neither are we. Association with adult onset diabetes was never the sort of thing they were looking for. It was carcinogens and toxicity. A lower bar, to be sure. Saccharin has been around since the 19th century and is still widely used. It was shown to cause bladder cancer in rats in the 60s, which led to its ban in Canada. A ban was proposed in the US too, but was blocked by congress. Subsequent research demonstrated that saccharin would not cause bladder cancer in other animals. Reassuring, but not entirely. conventional medical wisdom, which is probably why we have a diabetes epidemic. My 1917 diabetic cookbook has all the above treats strictly verboten. We once had it right! So can you resist fruits and starches too? Artificial sweeteners are likely the chink in this armor. As mentioned above, anyone who cuts them all out, and toughs their way through the craving period, will be able to easily resist. May take a couple of months, but it will happen. Cells need to reprogram to a new regime of running on fat (far more efficient) instead of sugar. But what if you are continually reminded of sweets? Here is where artificial sweeteners may be doing their dirty work: they keep the craving going. So we suppose this is what is happening. Continuance of sweets in the diet, even though artificial, keep the glucose craving alive. But there are other possibilities. 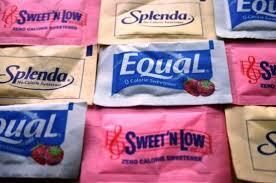 One is that most people that switch to artificial sweeteners do not lose weight—the usual motive for the switch. Is the body compensating somehow? (Grhelin comes to mind, as it would stimulate hunger and thus thwart fat weight loss through other forms of overeating.) And it is also possible that there is direct harm, and we just don’t know about it. We know many of you have tried all sorts of things. Share your experience. Maybe our collective wisdom will help us get to the bottom of this one. I agree with the thought that there is probably an issue with ongoing stimulus one gets from sweets. Maybe more than stimulus is reward. Think about it – you can over feed at Thanksgiving to the point of feeling nauseous. But, when the pumpkin pie comes out, it’s very hard to resist. My point when it comes to products such as artificial sweeteners or anything artificial for that matter is that we just don’t know for sure if they are safe. I got into an argument with someone once who insisted that they have been proven safe. All I have to say about that is that I don’t want to eat anything that has to be proven safe in the first place! I don’t have to have numerous studies done on an a green pepper or cabbage, esp. the organic ones. We keep hearing fake non-food stuff has been proven safe, just to have it disproved ten years later. After receiving a stent that I didn’t need, I decided to lose 30 lbs and perform anaerobic exercise, mostly on an elliptical machine, 4-5 days per week. I’m 6’1″ and 187 lbs. My former family practitioner continually told me that losing weight would not help my BP because I wasn’t obese. I went from being close to needing BP medicine to perfect BP. My BP runs from 99/60 to 124/78 virtually any time of the day. I eat little sugar, few carbs and salmon twice a week. I eat some grain fed bison or beef and IF I eat any chocolate, it’s dark chocolate with a cup of Joe. No other candy whatsoever. I also eat lots of veggies and fruit and I quit the tall glass of OJ that I used to drink every morning as OJ is very high in sugar.